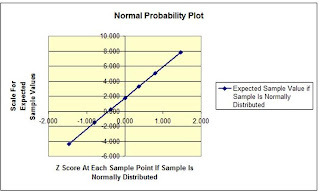 The normality test is used to determine whether a data set resembles the normal distribution. 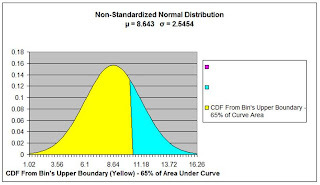 If the data set can be modeled by the normal distribution, then statistical tests involving the normal distribution and t distribution such as Z test, t tests, F tests, and Chi-Square tests can performed on the data set. There are a number of well-known normality tests such as Kolmogorov Smirnov Test, Shapiro Wilk Test, and the Anderson Darling Test. In this article we will describe two normality tests that can be performed with Excel, but are much simpler than the above tests. 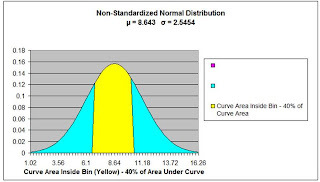 One characteristic that defines the Normal distribution is that Normally-distributed data will have the same amount of area of Normal curve between each point. 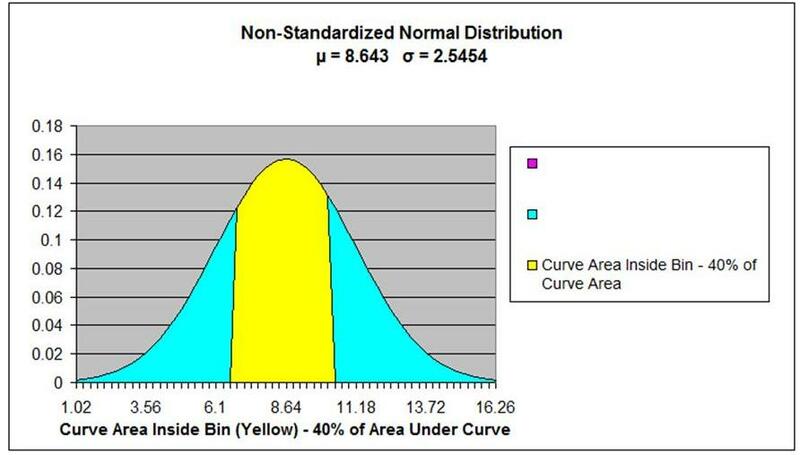 For example, if there were 7 sampled points total that were perfectly Normally-distributed, The area under the Normal curve between each point would contain 1/7 of the total area under the Normal curve. 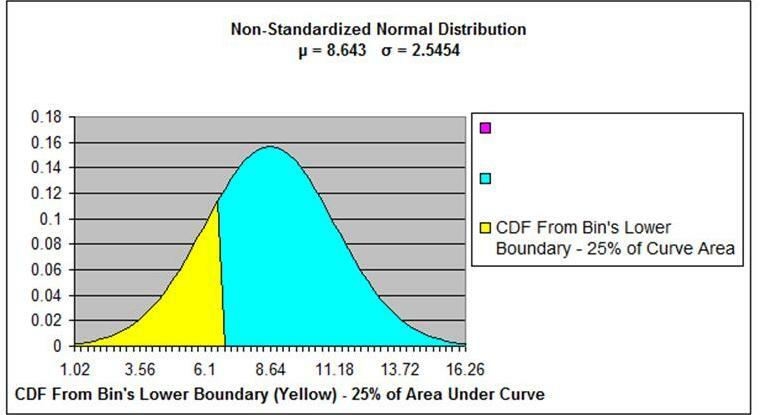 We can obtain the normal curve area between two sample points (on the X-axis) by using the Cumulative Distribution Function (CDF). The CDF at any point on the x-axis is the total area under the curve to the left of that point. 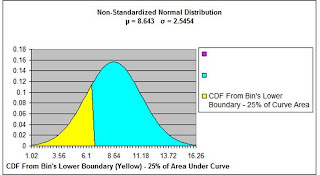 We can obtain the percentage of area in normal curve for each regionby subtracting the CDF at the x-Value of region's lower boundary from the CDF at the x-Value of the region's upper boundary. 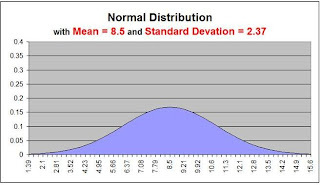 The normal distribution that we are trying to fit data has as its two and only parameters the sample's mean and standard deviation. Once again, this formula calculate the CDF at that x Value, which is the area under the normal curve to the left of the x Value. 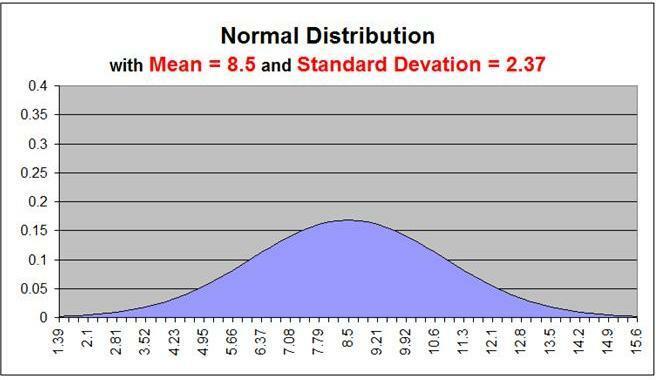 That normal curve has as its parameters the sample's mean and standard deviation. 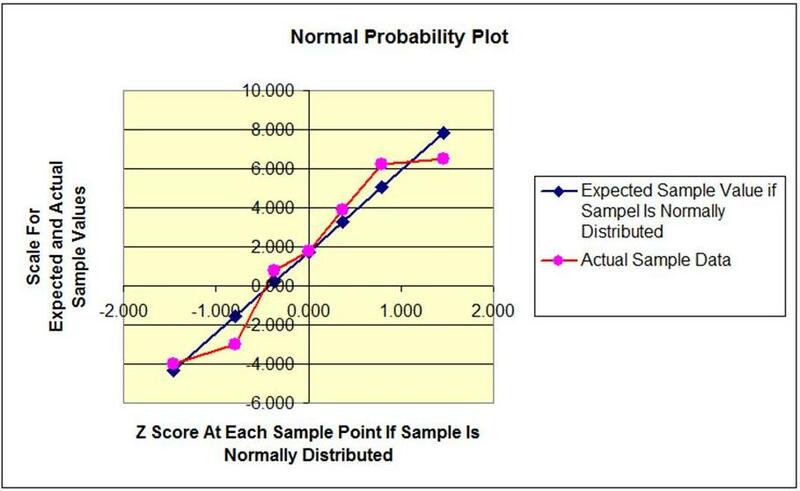 Given the above, here are the Steps to creating a Normal Probability Plot to evaluate the Normality of sampled data. 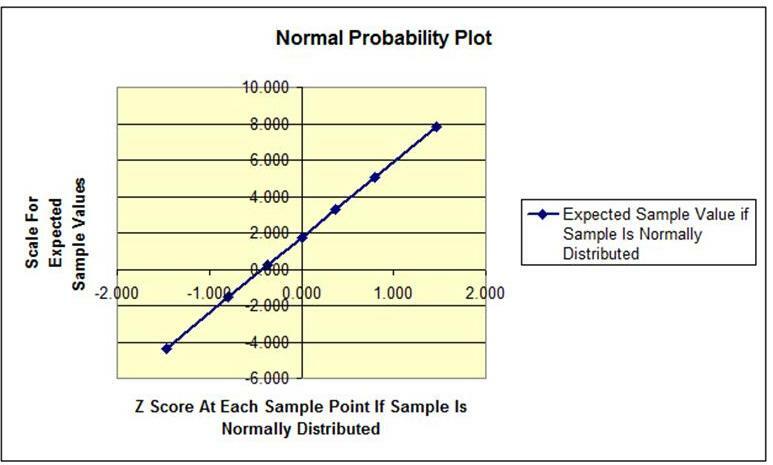 If there are 7 sampled data points that were perfectly Normally distributed, there would be 1/7 of the total Normal curve area between each sampled point. We can see that the Actual Sample Data (in purple) maps closely to the Expected Sample Values (in dark blue) so we conclude that the data appears to be derived from a Normally-distributed population. 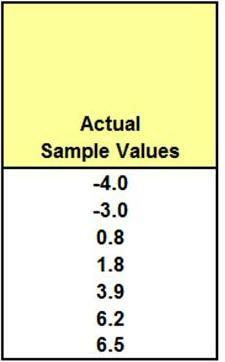 One caution: A larger sample size (at least 50) should be used to obtain valid results. The small sample size (7) was used here for simplicity. The data set is ranked in order and then plotted on a graph. Each point in the data set represents a y value of a plotted point. 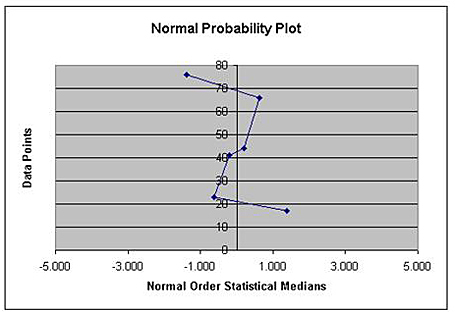 The x values of the points are Normal Order Statistic Medians. The closer than the graph is to a straight line, the more closely the data set resembles the normal distribution. Correlation analysis can also be performed the data set (called the Order Responses) and the Normal Order Statistic Medians. 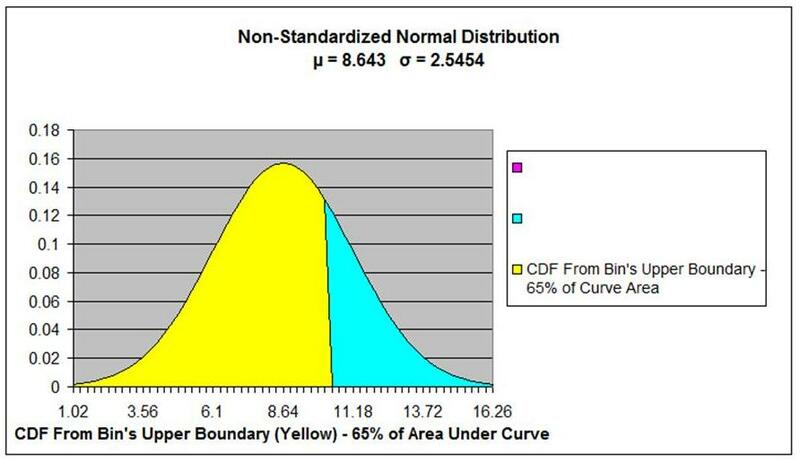 The closer the correlation coefficient is to 1, the more the data set resembles the normal distribution. G is called the Percent Point of the Normal Distribution. It is the inverse of the cumulative distribution function. In Excel, it would be the NORMSINV(x) function. It tells you the probability the x has a value of m(i) or less. Variable x is normally distributed on a standard normal curve (µ = 0 and σ = 1). 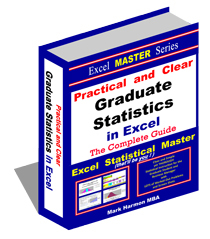 Now calculate U(i) – the Uniform Order Statistic Medians. 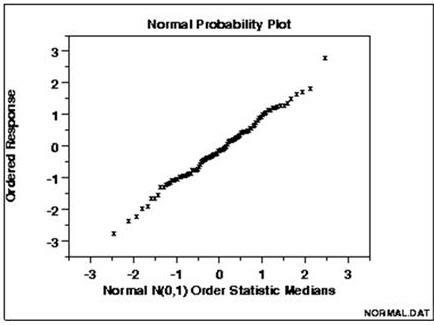 The Normal Order Statistic Medians are given by the following formula:N(i) = G(U(i)) --> G(U(i)) is the inverse of the cumulative distribution function. It tells the x value that corresponds to the probability U(i) that a random sample taken from a standardized normally distributed population will have a value of x or less. The closer that the plotted resembles a straight line, the closer the data set resembles the normal distribution. 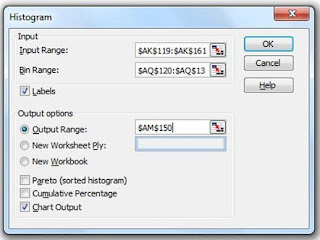 You can also run correlation analysis between the data set of Ordered Responses and the Normal Order Statistic Medians. The closer the correlation coefficient is to 1, the more closely the data set resembles the normal distribution. 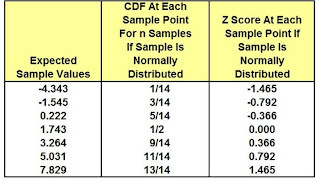 There are other well-known Normality tests such as the Kolmogorov-Smirnov Goodness-of-Fit Test, the Anderson-Darling Goodness-of-Fit Test, The Shapiro-Wilk Test, and the Chi-Square Goodness-of-Fit Test. 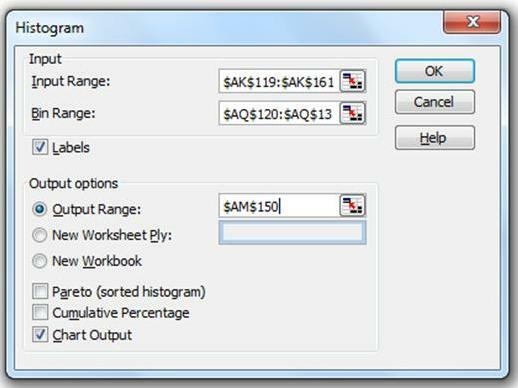 I will very shortly publish an article or two in this blog which will detail how to do these tests in Excel. 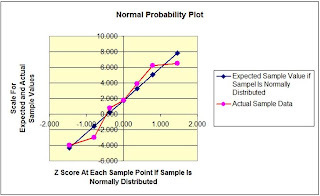 If you are going to perform any statistical analysis that uses the normal distribution or t distribution such as Z test, t tests, F tests, and chi-square tests, you should first test your data set for normality. The Normal Probability Plot described in this article is probably the easiest and quickest way to do it in Excel. 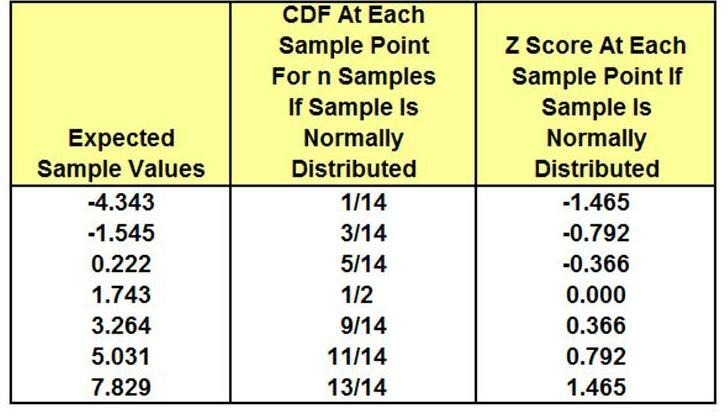 Where are you getting 1/14, 3/14, 5/14 ... for CDF at each sample point in the first Normal Plat example? The values of 1/14 etc. are the probability intervals. You get them as follows: start with 1/(2*n), so 1/(2*7), then add 2/2n to the previous value. You'll get 1/14, 3/14, 5/14, etc. As the author said, there's a 1/7th distance between each probability value, or 1/n in general. Just fixed it. Thanks for catching that. 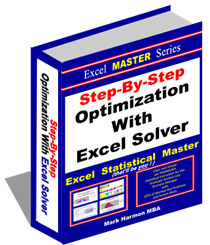 Excel is also very useful as SPSS. I found the first method of creating the normal probability plot helpful. But when I use the data from the second method for the first, the corresponding correlations do not agree. It looks like it is because of an error in the expression for m(n). You use 0.5(1/n) when it should be 0.5 to the 1/n power. When I make this change the correlations are close. In your first method you can quantify what you see by using the R² function --> =rsq(actual values;z-scores at each sample point if sample is normal distributed). The more closer to 1 the more the actual values are normal distributed.